Violinist Clayton Haslop joined the professional world of music as a teenager when he was invited by none other than Sir Neville Marriner himself to join the 1st violin section of the Los Angeles Chamber Orchestra. Less than two years later he performed as soloist under Marriner's baton in a number of critically acclaimed concerts that quickly established Haslop as one of the leading violinists to emerge from Los Angeles at that time. In the interim Haslop has traveled internationally both as a soloist and as a member of several recognized ensembles including the Los Angeles Piano Quartet, the New Hollywood String Quartet, and the Haslop/Sanders Duo (violin and guitar). Haslop has served as Concertmaster of the Los Angeles Chamber Orchestra, Los Angeles Music Center Opera, Dallas Opera, Santa Barbara Symphony, and several festival orchestras. Living in Los Angeles for most of his career, Clayton has performed on well over 1,000 motion picture titles and currently serves in the capacity of Concertmaster for James Horner (Titanic, A Beautiful Mind, The Mask of Zorro, A Perfect Storm, Apollo 13, How The Grinch Stole Christmas, etc. ), Don Davis (Matrix, Jurassic Park III), Alexander Desplat (Benjamin Button), and Michael Giacchino (Ratatouille, Up, Star Trek, The Incredibles, Mission Impossible II, Alias, Lost etc. ), as well as several other notable composers. 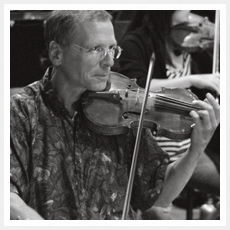 Clayton Haslop has also performed as Concertmaster of the Oscars, including the 2009 Academy Awards. While a student he was fortunate to spend three years coaching extensively with the great violinist Nathan Milstein. His other teachers include Eudice Shapiro and George Kast (while a Heifetz and Percy Faith Scholarship student at the University of Southern California USC), Guido Mansuino, and Sybil Maxwell.